WHY DID I START A BULLET JOURNAL? It is important to find out why you are interested in starting one. You might not think this is important but I think. 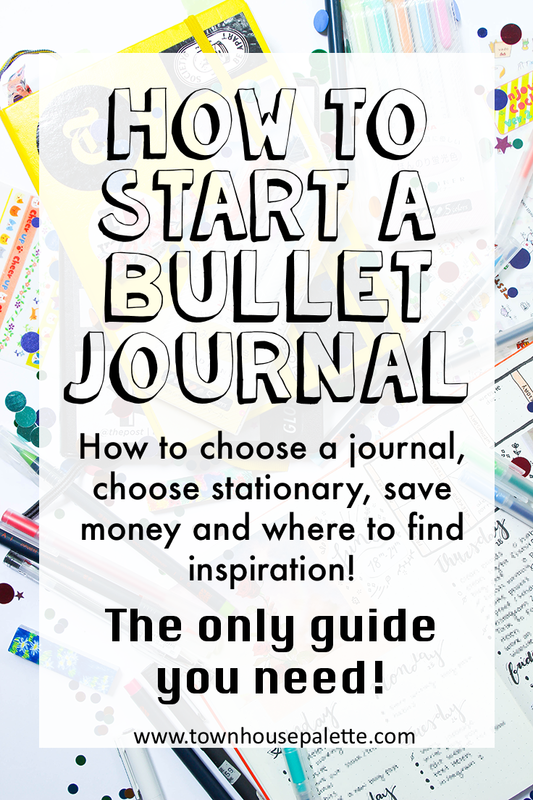 There are a lot of different methods for journaling and organizing, so ask yourself, why did do you want to start a bullet journal? Is it because it is trendy? If this is your answer then I want to ask a follow-up question. Do you have one of those Fjallraven Kanken backpacks? I am just messing with you. In reality, bullet journaling is a very cheap method of organization and I think it is the easiest method to try. Which leads me to why I started a bujo (bullet journal lingo my friends). 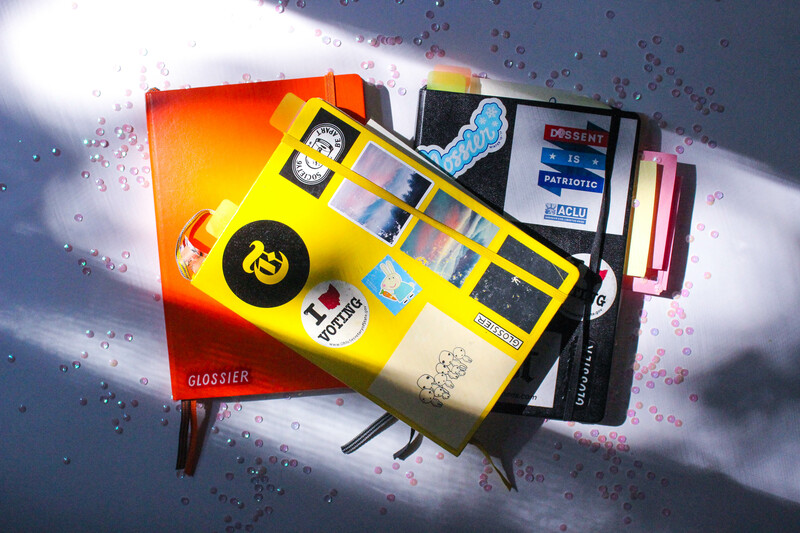 Before my bullet journal, I was interested in the ever-so-popular Erin Condren Life Planners. I really liked the morning / afternoon / evening columns and the decorating aspect. Long story short, I fell into the expensive trap of buying sticker sets from Etsy for my EC planner. The stickers were way too expensive and it was a mess. You can read more about that mess here. I found bullet journaling through the studyblr community on Tumblr. The aspect that really drew me in was that I could customize each journal and be really creative with how I designed each page. Also, I get tired of things quite easily so having the option to change how it looks every week is fantastic. I think I have been bullet journaling for almost three years and I still love it. Here are some videos and blog posts about my bullet journal. !WARNING: The videos are cringy! As you can see my bullet journal evolved over the years and it is still changing. To cut to the chase, I use a Leuchtturm1917 A5 Dotted Notebook*. I am going to break down the meaning of this notebook's title because once you understand each element, it makes it easier to find a notebook to suit you. Why do I like Leuchtturm1917s? The brand, Leuchtturm1917, is quite popular in the bullet journaling community, but other popular brands include Moleskins* and Muji*. I have only used Leuchtturm1917 notebooks so I don't have much to say on Moleskins or the Muji notebooks. I like how they come in a bunch of different colors, so each year I can get a new color :D The pages are numbered, and there is a table of contents (which I rarely use but that is just me) so you can find certain pages quickly. There is a small pocket in the back to keep cards or other flat items. It has 249 pages and I like the weight of the paper. Somethings others may not like would be that the paper is thin so you can see markings. However, it does not bleed through (unless you are painting on it). My first bullet journal was actually a cheap notebook from Amazon called the Essentials Grid-lined Notebook*. Just to test the method first before committing. I am not going to lie, I was so confused when I first came upon sizing. I was like, "A5? what does that mean?" My small American brain could not fully comprehend what these letters and numbers had to do with notebooks. Then I found out that it is just a fancy way of saying the paper size, and it is a part of a set called ISO 216. The ISO 216 is a measurement system by the International Organization of Standardization. It is basically like how the entire world uses the metric system and the U.S. uses its own system. 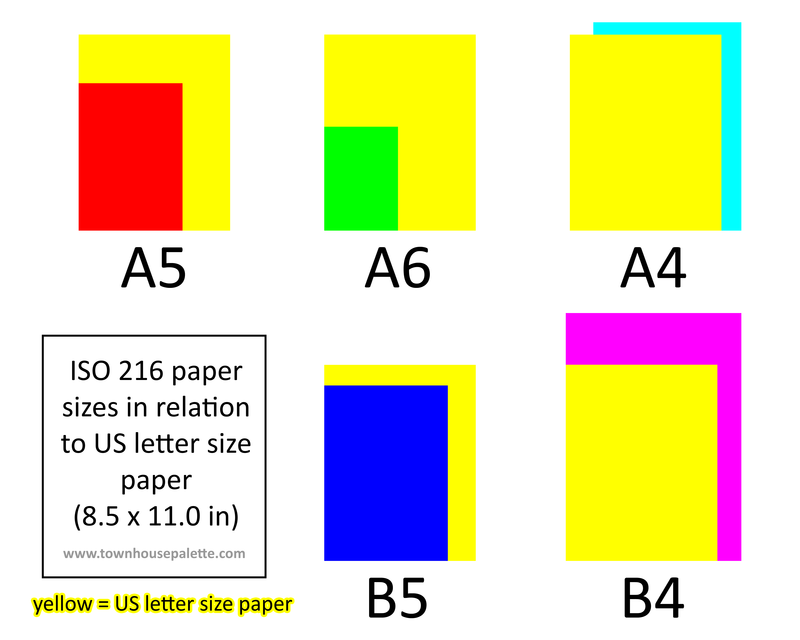 I tried searching for images that would show you the relation between letter size paper and ISO 216 but none of them were up to my liking so I used my photoshop skills and made one! Judging by the chart, you can probably determine what size to choose. If you live outside the U.S. then you probably are familiar with what size you are comfortable with. I use A5 notebook because it is the perfect size for me. It is a nice medium sized notebook. It not too small, where you have a hard time fitting everything, or too big, you can't take it anywhere. Also, the price is $19.95, which is ok. If that is too expensive, the first bullet journal I used was a squared A5 notebook for about $10.00 (I previously mentioned it). 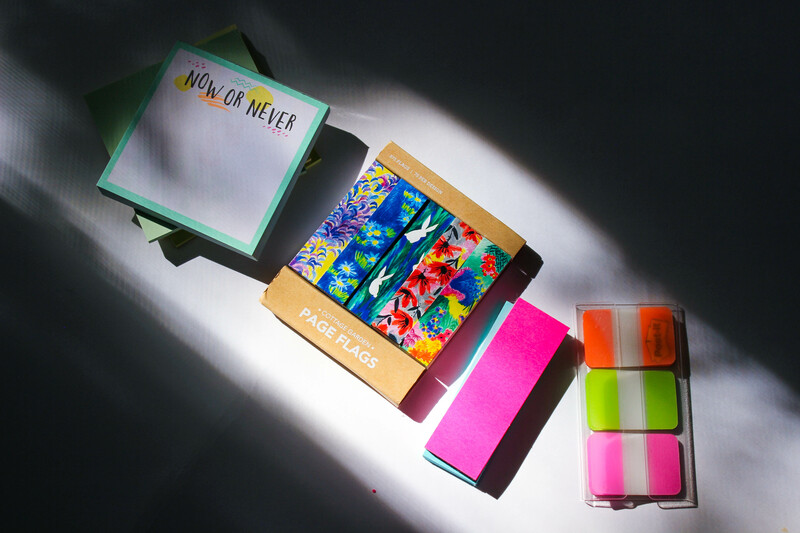 But if you are committed to this method it is important to invest in a good notebook since you will be using it every day and will be taking it places. The fancy thing about Leuchtterm1917 notebooks, and ones like it, is that it has different page ruling options. You probably know about the common styles like ruled and plain. Then in math class, you probably used squared paper. The dotted paper is literally just dotted paper. I prefer to use the dotted paper because the dots don't distract from any art/creative elements I make in my notebook but it does provide me with guides when I want to draw straight lines and such. Now the other fun part: Supplies!!! 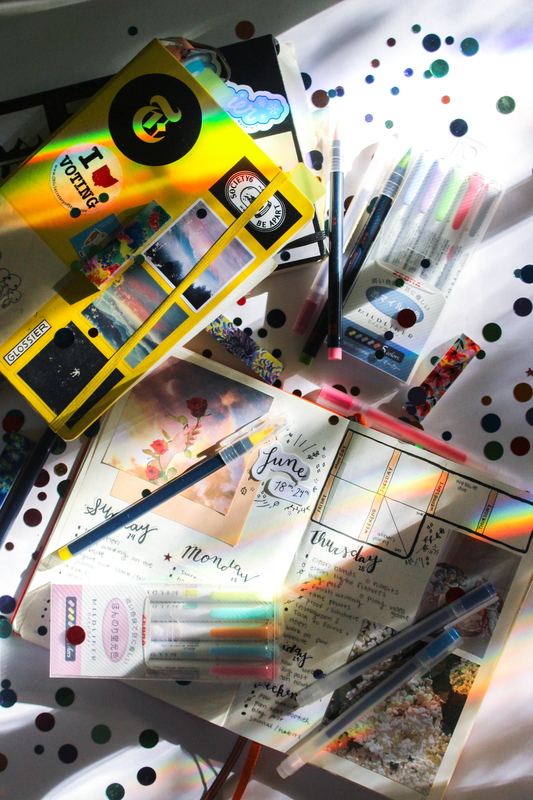 Like I mentioned before, you only need a pen and a notebook to start bullet journaling, but if you want to start exploring your creative side through bullet journaling, lets touch on some supplies. If you look in the pencil pouch of bullet journalists around the world, you will probably find two items: a set of Zebra Midliners and Muji Pens. Both are products from Japan (Japanese stationery is where it is at!). 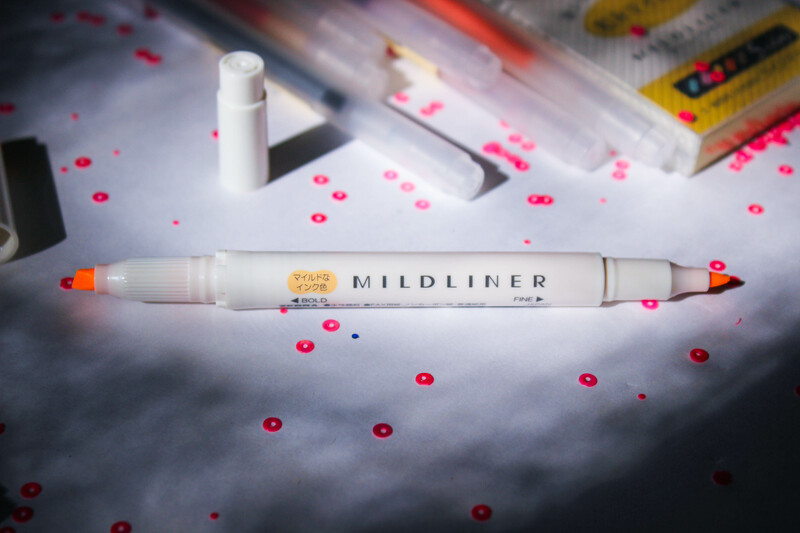 Zebra Midliners* are dual-sided markers, one fine point marker, and a chisel tip marker. You can get the 15-pack for about $13.00 (they just released a new color set you have to buy separately). I use these especially when I want to do a quick, simple spread with some colors. I also use it to color code. 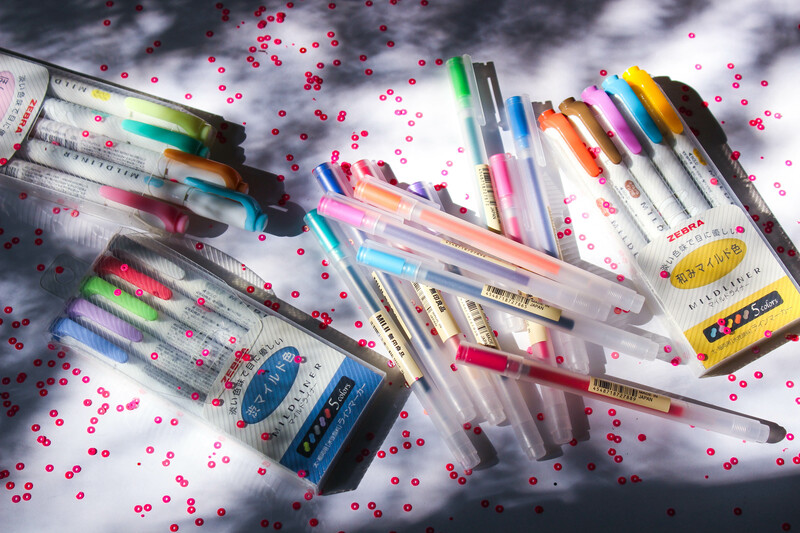 Muji Pens* are just really nice pens. I really like the colors and they are not too expensive. Amazon sells the nine pack but actual Muji stores sell the 12-pack. The pens have different ballpoint sizes if that is something that concerns you, but I use the 0.5mm ballpoint size. Would I recommend these two items for beginners? Actually yes. I am going to assume you use a black pen as your everyday pen. 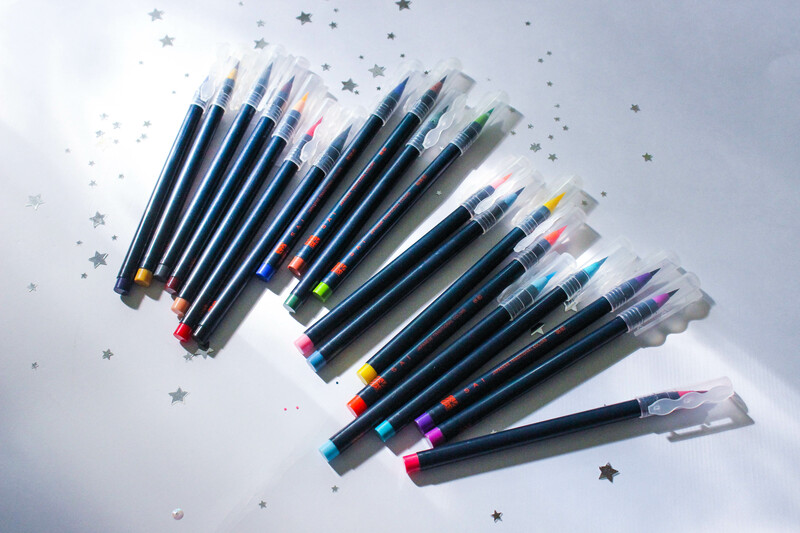 If you don't, then think about your ideal pen color while reading this section. Like the notebook, investing a black pen is a great idea and something I stand by. I have a lot of black pens...A LOT. Why? To find the perfect one. Have I found "the one?" I think so. Do I use it? no. Did I lose it? yes. I think about my pen every day, no joke. My favorite pen was a black Pilot Juice .5mm ballpoint pen* (The one I linked is the retractable one, slightly different from mine). It wrote so smooth and dried quickly! I need to buy another one, but I just want one which will be hard to find considering I got this from a stationary shop in San Francisco. 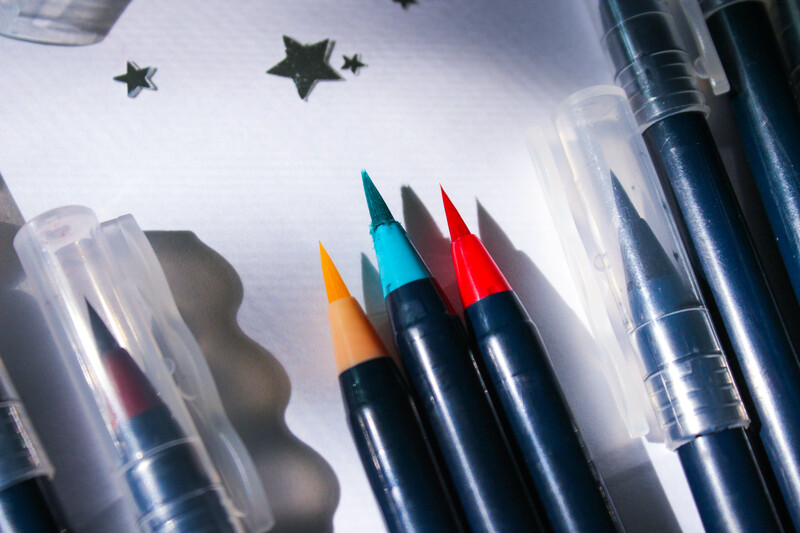 Other "the black pen" pens I use would be a Muji 0.5mm black pen* (I would just buy the nine-pack with all the colors), Le Pen*, Le Pen .3 drawing pen* and a Pilot G2 gel pen*. 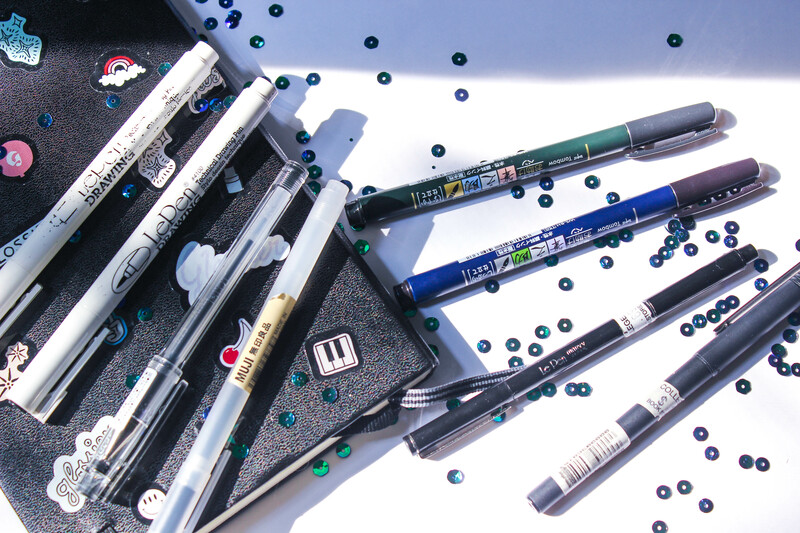 To find one and to save some money, I would highly recommend going to a craft, book or stationery store and test all the pens they have on display. These kinds of stores sell single pens, so you don't have to commit to a pack of pens and not knowing what you like in a pen. For a while, I have been using watercolor pens to decorate my bullet journal. The ones I use, the Akashiya CA200/20V Sai Watercolor Brush Pens*, are kind of hard to work with so you might want to opt with mini watercolor palettes*. With that being said, the Sai Watercolor Brush Pens are nice. If you are into painting and caligraphy, then I would suggesting givign them a try. I got these almost two years ago and I am still learning how to use them. Painting is the route I take when it comes to decorating my bullet journal. However, along with painting, I dabble in the realm of calligraphy. I use these two pens found on Amazon called the Tombow Fudenosuke Brush Pens*. One has a stiff tip which I use to draw the letters, and the other has a more flexible tip used for creating the thicker caligraphy strokes. I highly recommend them! I am going to start with post-it notes and tell you I use anything from Target, Walmart or Staples. But the pretty page flags in the center are from a stationary shop in Little Tokyo in San Francisco. For stickers, it is about to get crazy. 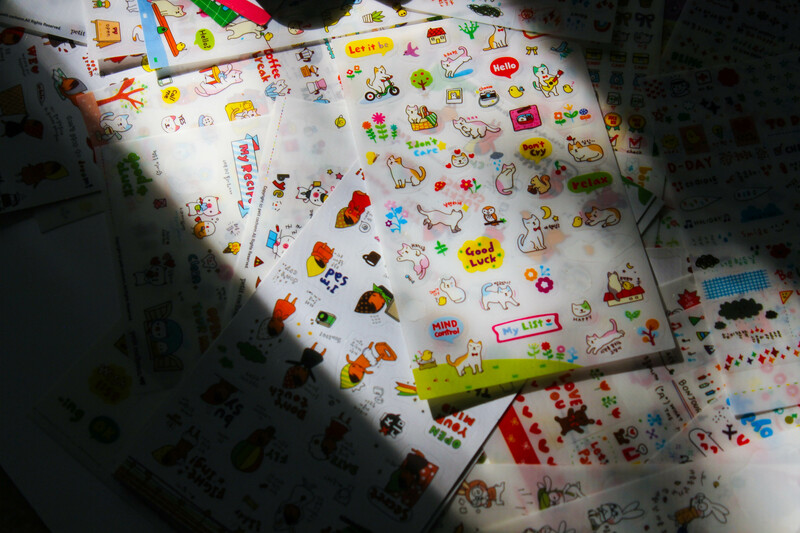 I have always been a sticker fanatic so I have always had some, but THEY CAN BE EXPENSIVE! If you read my post about switching over to a bullet journal as mentioned above, you would know that the Erin Condren planner stickers are expensive. I still have some left over that I use. If you have an extra buck to spend, Etsy does sell some very practical planning stickers, also, you are supporting independent sticker creators! With that being said, do not be fooled by some of the Korean / Japanese deco stickers and washi tapes found on Etsy and Amazon. You are practically paying extra for no reason! I found a lot of the Etsy and Amazon sellers buy their products from Chinese wholesale sites and sell them for a higher price. 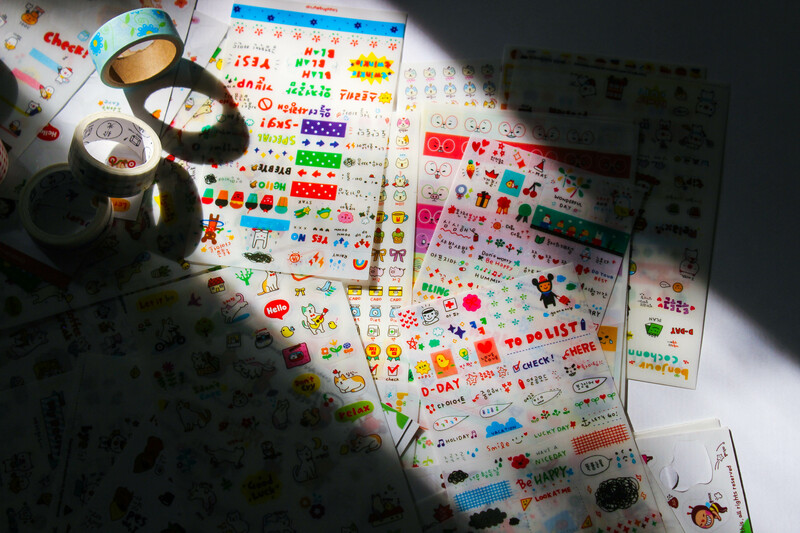 That is why I tend to get a majority of my cute stickers and washi tapes from Ali Express. For example, An Etsy seller is selling these stickers for $2.41 while Aliexpress is selling the SAME EXACT stickers for $0.32. However, an Amazon seller is selling these cat stickers for $5.99, Aliexpress is selling the SAME EXACT stickers for $1.18. Another pro-tip is finding images online and printing them out. It is a relatively cheap way to decorate your bullet journal. Also, try using very thin fabrics and papers with interesting textures for a cool effect. 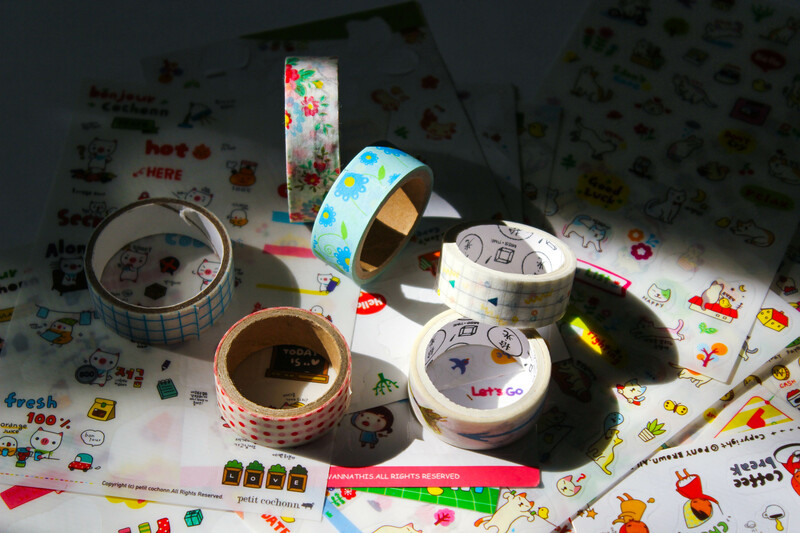 Also, Aliexpress has a fantastic selection of washi tape for about a $1.00 per roll. When you watch my first bullet journal flip through video, you might be saying, "wow, her bullet journal is lame. "But unless you are a seasoned artist, your first bullet journal will be looking a bit blah. However, as you take inspiration and practice you will find out what works best for you, your bullet will be looking good! I know a lot of people who start bullet journaling for the first time, often times get discouraged by other people's journals. I just want to say that it takes time and, as a perfectionist, it is ok to mess up. Just glue the pages together or rip them right out. Will it mess up your table of contents? no, because if it is ripped out, was it ever really there? Let's start with Pinterest, you probably found this post on Pinterest! Obviously, you can search for bullet journal page ideas and go from there. Then creating your own bullet journal board will keep all the photos you like together. Here is my studyblr + bullet journal Pinterest board. I pin photos from a bunch of different platforms like Tumblr and Instagram so you will get a variety of content. Going off of that, Tumblr's Studyblr community has a TON of content and that is where you will get the most inspiration for your bullet journal. Obviously, you can pin straight from there but it does not hurt to create your own account and reblog some content. Last but not least, PRACTICE PRACTICE PRACTICE! I hope this guide was helpful and it made your bullet journal journey a lot easier. I will be updating this guide in the future, so if you have any suggestions, let me know in the comments! THERE ARE NO DUMB QUESTIONS! 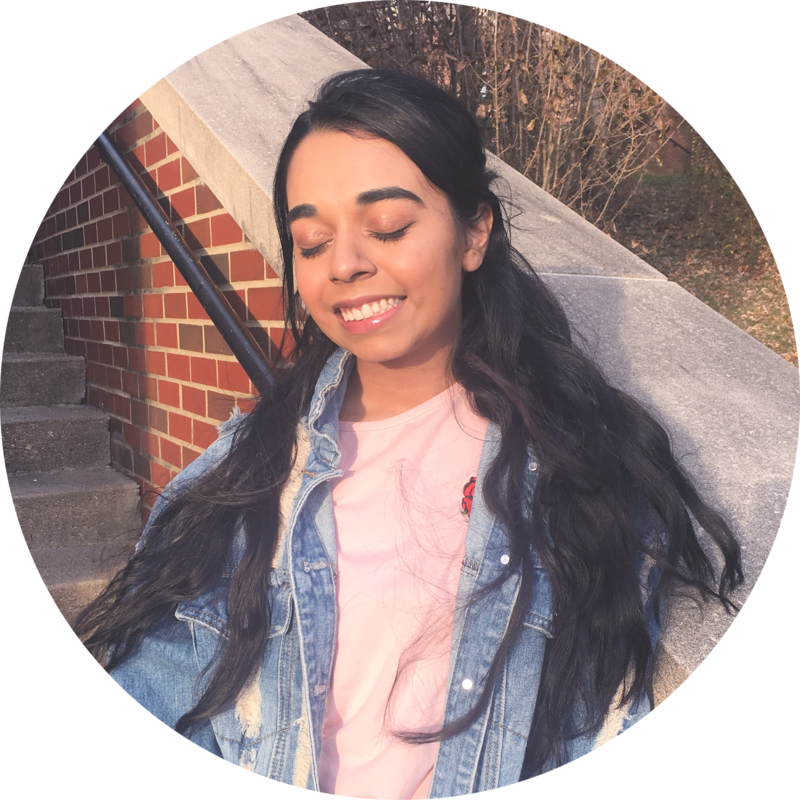 So if you want to ask me something let me know in the comments or, if you want to privatley message me, hmu on instagram (@laila.riaz or @townhousepalette) and I wll be happy to answer! Also, please pin the image below and share with friends. It would mean the world to me.